For other uses, see Ob (disambiguation). The Ob River (Russian: Обь, IPA: [opʲ]), also Ob', is a major river in western Siberia, Russia, and is the world's seventh-longest river. It forms at the confluence of the Biya and Katun Rivers which have their origins in the Altay Mountains. It is the westernmost of the three great Siberian rivers that flow into the Arctic Ocean (the other two being the Yenisei River and the Lena River). The Gulf of Ob is the world's longest estuary. The internationally known name of the river is based on the Russian name Обь (Obʹ). Possibly from Proto-Indo-Iranian *Hā́p-, "river, water" (compare Vedic áp-, Persian āb, Tajik ob, and Pashto obə, "water"). Katz (1990) proposes Komi ob 'river' as the immediate source of derivation for the Russian name. Katz's proposal of a common Finno-Ugric root, loaned early on from a pre-Indo-Iranian source related to Sanskrit ambhas- 'water' is deemed improbable by Rédei (1992), who prefers to analyze this as a later loan from a descendant of the non-nasal root form *Hā́p-. The Ob is known to the Khanty people as the As (the source of the name "Ostyak"), Yag, Kolta and Yema; to the Nenets people as the Kolta or Kuay; and to the Siberian Tatars as the Umar or Omass. The Ob forms 25 km (16 mi) southwest of Biysk in Altai Krai at the confluence of the Biya and Katun rivers. Both these streams have their origin in the Altay Mountains, the Biya issuing from Lake Teletskoye, the Katun, 700 kilometres (430 mi) long, bursting out of a glacier on Mount Byelukha. 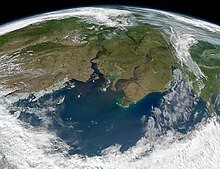 The Ob's entire main course is within Russia, though its tributaries extend into Kazakhstan, China and Mongolia. The river splits into more than one arm, especially after joining the large Irtysh tributary at about 69° E. (Originating in China, the Irtysh is actually longer than the Ob from source to the point of their confluence.) From the source of the Irtysh to the mouth of the Ob, the river flow is the longest in Russia at 4,248 kilometers (2,640 mi). Other noteworthy tributaries are: from the east, the Tom, Chulym, Ket, Tym and Vakh rivers; and, from the west and south, the Vasyugan, Irtysh (with the Ishim and Tobol rivers), and Sosva Rivers. The Ob zigzags west and north until it reaches 55° N, where it curves round to the northwest, and again north, wheeling finally eastwards into the Gulf of Ob, a 1,000-kilometre-long (620-mile) bay of the Kara Sea, separating the Yamal Peninsula from the Gydan Peninsula. 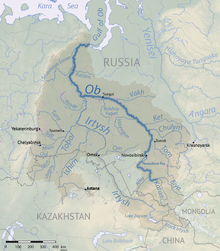 The combined Ob-Irtysh system, the fourth-longest river system of Asia (after Yenisei, and China's Yangzi and Yellow rivers), is 5,410 kilometres (3,360 mi) long, and the area of its basin 2,990,000 square kilometres (1,150,000 sq mi). The river basin of the Ob consists mostly of steppe, taiga, swamps, tundra, and semi-desert topography. The floodplains of the Ob are characterized by many tributaries and lakes. The Ob is ice-bound at southern Barnaul from early in November to near the end of April, and at northern Salekhard, 150 km (93 mi) above its mouth, from the end of October to the beginning of June. The Ob River crosses several climatic zones. The upper Ob valley, in the south, grows grapes, melons and watermelons, whereas the lower reaches of the Ob are Arctic tundra. The most comfortable climate for the rest on the Ob are Biysk, Barnaul, and Novosibirsk. The Ob provides irrigation, drinking water, hydroelectric energy, and fishing (the river hosts more than 50 species of fish). There are several hydroelectric power plants along the Ob river, the largest being Novosibirskaya GES rated at 460 MW. The navigable waters within the Ob basin reach a total length of 15,000 km (9,300 mi). The importance of navigation in the Ob basin for transportation was particularly great before the completion of the Trans-Siberian Railway, since, despite the general south-to-north direction of the flow of Ob and most of its tributaries, the width of the Ob basin provided for (somewhat indirect) transportation in the east-west direction as well. Until the early 20th century, a particularly important western river-port was Tyumen, located on the Tura River, a tributary of the Tobol. Reached by an extension of the Ekaterinburg-Perm railway in 1885, and thus obtaining a rail link to the Kama and Volga rivers in the heart of Russia, Tyumen became an important railhead for some years until the railway extended further east. In the eastern reaches of the Ob basin, Tomsk on the Tom River functioned as an important terminus. Tyumen had its first steamboat in 1836, and steamboats have navigated the middle reaches of the Ob since 1845. The first steamboat on the Ob, Nikita Myasnikov's Osnova, was launched in 1844; the early starts were difficult, and it was not until 1857 that steamboat shipping started developing in the Ob system in a serious way. Steamboats started operating on the Yenisei in 1863, on the Lena and Amur in the 1870s. In 1916 there were 49 steamers on the Ob; 10 on the Yenisei. In an attempt to extend the Ob navigable system even further, a system of canals, utilizing the Ket River, 900 km (560 mi) long in all, was built[by whom?] in the late 19th-century to connect the Ob with the Yenisei, but soon abandoned as being uncompetitive with the railway. The Trans-Siberian Railway, once completed, provided for more direct, year-round transportation in the east-west direction. But the Ob river-system still remained important for connecting the huge expanses of Tyumen Oblast and Tomsk Oblast with the major cities along the Trans-Siberian route, such as Novosibirsk or Omsk. In the second half of the 20th century, construction of rail links to Labytnangi, Tobolsk, and the oil and gas cities of Surgut, and Nizhnevartovsk provided more railheads, but did not diminish the importance of the waterways for reaching places still not served by the rail. A dam built near Novosibirsk in 1956 created the then-largest artificial lake in Siberia, called Novosibirsk Reservoir. From the 1960s through 1980s, Soviet engineers and administrators contemplated a gigantic project to divert some of the waters of Ob and Irtysh to Kazakhstan and the Soviet Central Asian republics, replenishing the Aral Sea as well. The project never left the drawing board, abandoned in 1986 for economic and environmental considerations. In its early years of operation, the Mayak plant released vast quantities of radioactively contaminated water into several small lakes near the plant. These lakes drain into the Techa River, whose waters ultimately flow into the Ob River near the end of its path. In addition, the Nadym River and the Pur River flow into the Gulf of Ob and the Taz River into the Taz Estuary, a side arm of the Gulf of Ob. ^ "Ob River at Salekhard". River Discharge Database. Center for Sustainability and the Global Environment. 2010-02-13. Retrieved 2010-11-06. ^ Katz, Hartmut. Zum Flußnamen Ob. — Specimena Sibirica III, pp. 93–95. Wien. ^ Rédei, Károly. Szófejtések. — Nyelvtudományi Közlemenyek 93, pp. 125–135. ^ "Location of Novosibirskaya GES". Google Maps. Retrieved 1 July 2017. This article incorporates text from a publication now in the public domain: Chisholm, Hugh, ed. (1911). "Ob" . Encyclopædia Britannica. 19 (11th ed.). Cambridge University Press. Wikimedia Commons has media related to Ob River.